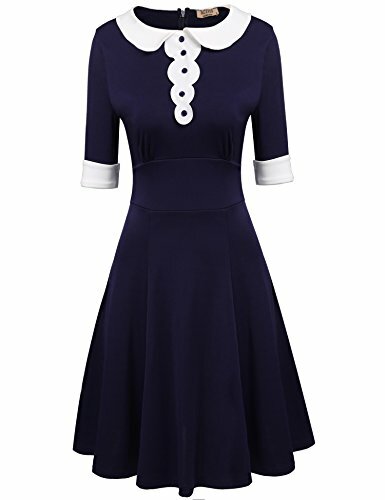 Design: elegant fit, half sleeve, doll collar, above knees, high waist. Features: casual style for women work, classic style dress, fashionable and never go out of style. This casual flare dress with a-line skirt and straight hemline that hits at the knee,keeps your look fresh and flirty. Suit for Casual Occasion: wedding party, evening prom, office, cocktail, summer holiday, daily wear, Christmas Day, Thanksgiving Day. Size: 5 sizes (S/M/L/XL/XXL) available. Please be advised to our size chart in the picture area on the left for accurate fit. S: ----Shoulder 14.5"----Sleeve 10.0"----Bust 32.7"----Waist 26.4"----Center Back Length 35.6"
M: ----Shoulder 15.0"----Sleeve 10.2"----Bust 34.6"----Waist 28.3"----Center Back Length 36.2"
L: ----Shoulder 15.7"----Sleeve 10.6"----Bust 37.6"----Waist 31.3"----Center Back Length 36.8"
XL: ----Shoulder 16.4"----Sleeve 10.9"----Bust 40.6"----Waist 34.3"----Center Back Length 37.4"
XXL: ----Shoulder 17.1"----Sleeve 11.2"----Bust 43.6"----Waist 37.3"----Center Back Length 38.0"